"Il gémissait et il bavait, il avait des espèces de convulsions qui cessèrent au bout d'un quart d'heure..." (He sighed and frothed at the mouth, he had the type of convulsions which stopped after a quarter of an hour...'). This report given by Talleyrand in the year 1805 is not the only contemporary evidence of Napoleon having epileptic seizures. The question whether Napoleon had epilepsy or not has always been a matter of controversy, however. The scholars who do not doubt that the French emperor suffered from the disease list the following etiological factors: the fact that his father was an alcoholic, that Napoleon suffered from pronounced bradycardia (with secondary disturbed blood supply to the brain), and from slight hydrocephalus. The opponents of the 'epilepsy-theory' point out that none of the many doctors who attended the emperor ever mentioned any suspicion that he might have epilepsy. However, this could be explained by the fact that they had to be very careful how they worded the diagnoses pertaining to their imperial patient. 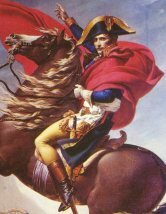 If Napoleon really did suffer from epilepsy - and indeed, there are more indices which suggest he did than suggest that he did not - his seizures appear to have been few and did not noticeably impede his activities.